Dementia Clock is an app designed by Rogue Software and is currently available for use on iPad only. The app has been marketed towards users with dementia and is intended to reduce confusion and anxiety by orienting users to the current day and time. It consists of two screens: a main display showing the time, day, and date in large font; and a recording screen where caregivers can record their own messages which play when the display screen is tapped. The clock is available in English, Portuguese, and Spanish, and has built-in voices available for selection. The default settings play two audio files back-to-back when the display screen is tapped, first speaking the day of the week followed by the time of day (morning, afternoon, or evening). Press-to-record feature to personalize messages, with a review button available on the settings screen, so that users can make changes as needed. Not possible to adjust time periods during which recordings play. This app has been undersold by developers. It has the potential to reach a much larger demographic of users including those with: dementia; executive functioning deficits; ADHD; anxiety; ASD; visual impairments; and more. 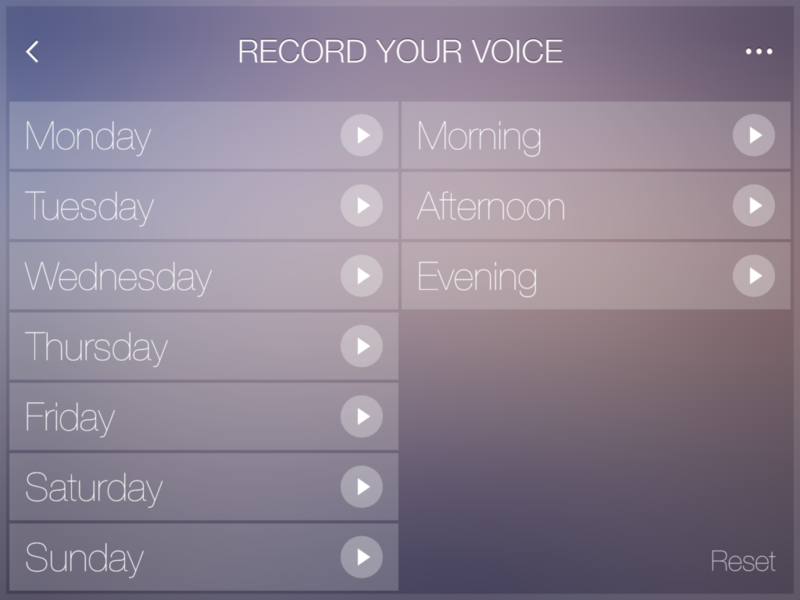 Though the recording features are limited, a little outside-of-the-box thinking can quickly turn this app into an auditory first/then board or pre-loading tool: on the recording screen, tap the day to record a blank message and then use each of the morning/afternoon/evening buttons to record the day’s activities (ex. “first shower, then breakfast”). For a more personal message, support staff can record greetings, words of encouragement, or even short, calm down routines. Range of use for this application is only limited to the creativity of the individual programming it. One of our group homes has been successfully using it with one individual who is visually impaired, with an accessibility switch. Trial-and-error experimentation will quickly show this app’s potential. Further updates by the developer will hopefully improve the settings available, but as-is this app is an excellent tool to have in your toolbox.